Largehearted Boy: Book Notes - Margaret Malone "People Like You"
Book Notes - Margaret Malone "People Like You"
Margaret Malone's short fiction collection People Like You is a mesmerizing debut, filled with characters whose hardscrabble lives will haunt you long after you finish their stories. "This is the book I am personally going to put into peoples' hands the moment it gets born. 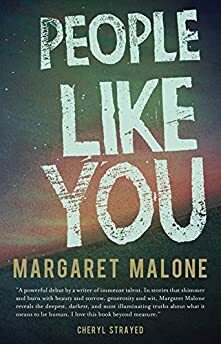 The stories in Margaret Malone's collection People Like You will blow your mind, steal your heart, and leave your DNA rearranged. Her writing is brilliantly urgent and alive. The biggest mouth-to-mouth resuscitation of storytelling I've seen in years." The way music works in my brain has something to do with memory. I don’t quite understand it. Like a tea that is stronger the longer it steeps. This is true too with writing. The characters in the stories of People Like You, I love them for what they are, and I love them for what they were over the course of twenty or thirty or forty rewrites, and I love all the ways I hated them when I couldn't figure them out. And now here I am mixing memory and music and story and character in one big knotted up mess. It's pretty dreamy. You know, if you like dreams where you have peanut butter stuck all over your hands and the phone is ringing and you have to answer it because it's someone really important but for the life of you, you cannot find a paper towel. Some of the song memories here are mine, the writer's; and some of the song memories here are the characters'; and some of the song memories here are both. Putting together this playlist, I stopped trying to figure it out. It’s all knotted together now in a way that can’t be undone. And so this is how my playlist became born. The nine stories in People Like You each get a song here. I'll list the story, and then the song that snugs up against it or fits inside the heart of it. Here’s to hoping you find a memory that you like. People Like You – The first Bert & Cheryl story. A party, bad directions, pregnant women and balloons. The song is like driving fast on the freeway and trying to keep eyes on the landmarks as you pass – ever watch someone’s eyeballs jumping around while they follow the landscape at seventy miles per hour? This song is that. The Only One – The youngest narrator in the bunch, but also arguably the smartest. I wish I had been her when I was that age. Fruit Bats – "When U Love Somebody"
This song has everything that love is when you are young and maybe haven’t been in love before, or think you might be in love but are afraid to tell anyone, or think you’d want to be in love but aren’t sure how to go find it. All that ache. So good. Yes – This is what she says when asked. This song is that feeling that is especially powerful at the intersection of adulthood and adolescence – when most of us don't really know what we want yet, but we know for damn sure what we don't want, and at this age that not wanting is everything. The Things We Know Nothing About – The loneliest narrator here marinating in a soup of comedic awfulness. The Notwist – "Good Lies"
I could have picked almost any song by this German band from any of their albums starting with Shrink from 1998. Nobody does the full range of melancholy better, from the isolation all the way through to the burn of joy that comes with memory. But this song is particularly appropriate. Saving The Animals –I wish this narrator knew how awesome she was: I have hope that someday she will understand. Thao Nguyen & the Get Down Stay Down – "Swimming Pools"
All the ways that girls are tough and beautiful and better than they may know, that’s what this song is; and it's for those of us out there who need to be reminded that the parameters of our worth are grander than we’ve been told. I’m Your Man – The second Bert & Cheryl story. It’s, um, a little uncomfortable in spots. The Dodos – "Red and Purple"
I want to disappear inside the percussion of this song. And I love that I have no idea if the song is about war or love or neither. For my purposes it's about sustaining in the trenches; you know, when it doesn’t always look the way you thought it would. Good Company – The longest story by far in the collection. It’s about a man and a woman but really it’s about the ways we find family in unexpected places, like the desert at Christmas over cake. Dinah Washington sings Bessie Smith – "Send Me To The 'Lectric Chair"
All I can say is that the energy of this song is everything that the Mother in this story is (you know, except for the murdering part), and it's also everything the narrator wants to learn from her. Also it's Dinah Washington, just listening to her sing makes me feel wise and invulnerable. Sure Footing – One of the first stories I ever wrote. I have a soft spot for this one. The Lucky Stars – "The Tattooed Lady"
Sometimes having your body loved right by a man is enough. Welcome To Samsara – The third and final Bert & Cheryl story. A zygote, a sexless Hawaii, and Ocean vs. Pool. The last story in the collection. Tom Waits – "Little Trip To Heaven"
If you're a fan of Tom Waits, it's impossible not to hear the everything of everything in his voice on this one: the wonder and joy and pain and loss and sinking and floating and around and around we all go in this life, willing participants, because the beauty is so beautiful and the sad is so sad and, even still, it is worth every moment, isn't it? Wouldn’t most of us do it all again?